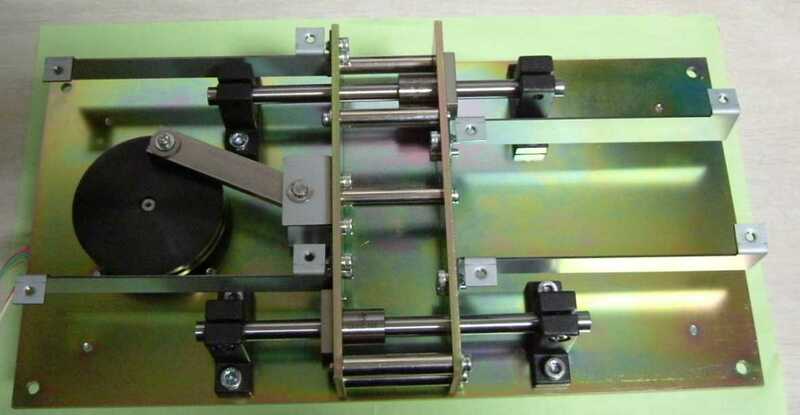 I assembled main mechanical parts of the designed polisher for stone. The photo shows the reciprocating mechanism which consists of 2 linear bushes and shafts. The linear bushes contain ball bearings, so friction is very little compared with slide friction. The shafts are polished and hardened SUS 440 steel of diameter 8mm. The linear bushes are driven by link. The base and other sheet metal are common 3.2mm thick steel. Arms are 1mm thick. The mechanism is exerted at max 2.3kHz pulse rate.